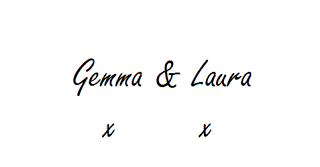 Tartan Fairytales : Wedding Talk: Guest Books! Hey all! Sorry for being a little M.I.A again but sometimes in life you can be too busy for words! 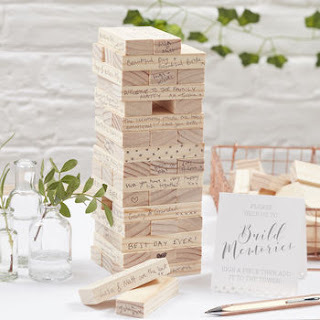 I thought we would ease ourselves back in with a little wedding talk on something that is becoming more and more popular with all the unique ways you can do them - guest books! The first time I ever had a guest book was at my 18th birthday party - my big cousin made me one and I love looking back at all the special messages from everyone and being reminded of such a good night. Then I had one again at our engagement party and I love looking at that even more due to everyone wishing Sam and I years of happiness. Now Sam & I are on the hunt for a perfect one for our wedding. If you, like myself are a pinterest fiend you will have seen all the different types of guest book you can have these days! This first one is a beautiful drop box frame guest book from Wooden Engraved Shop on Etsy and you can pick it up here. 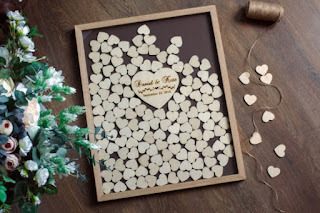 The idea is that all your guests sign or write a message on a little heart and drop it into the frame. There is a heart in the middle for you and your partners name plus your wedding date, then all the smaller little hearts sit around them. I love this idea as it is something you can actually display in your house instead of it ending up in a drawer like many others - including my two! This next one would probably be better for the more intimate weddings as it is a little smaller. My wedding only has imitate family attending so this would be perfect for our day! 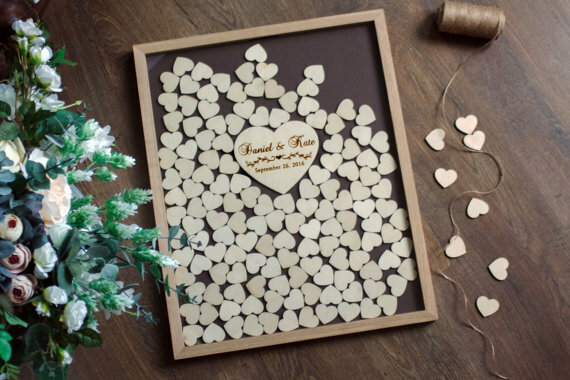 This is a similar idea to the one above in the sense your guests write a message on a heart and drop it in. 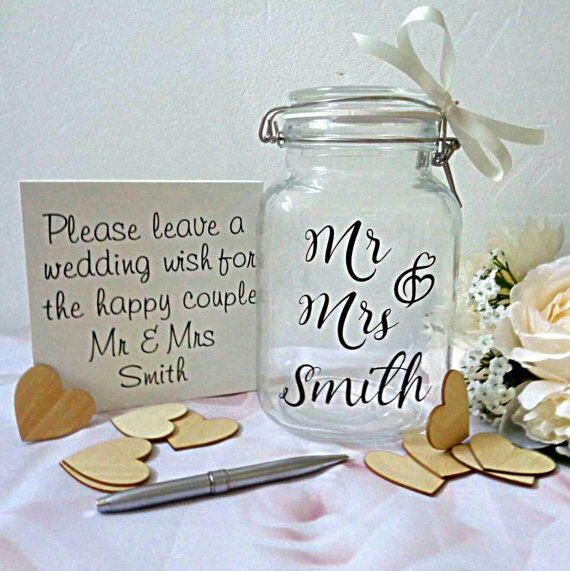 It again can be displayed anywhere in the house which I love and is something that is so timeless so you can keep it on display forever which is something you want for when you have something in relation to your wedding day! You can pick this up here from handmadebydebmac on esty! I am honestly obsessed with the next one and truthfully, I'd probably get this for our wedding if we weren't getting married abroad as I'd be worried about losing a piece when I return home! I love this unique idea as it makes me think of everyone signing it reflecting a piece in our jigsaw. 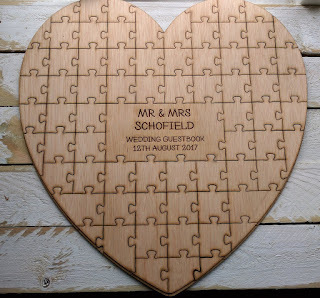 Cheesy I know but I love it, everyone invited to your wedding should be someone you want in your future jigsaw I think! If I was to get this, I think I would frame it so we could keep it displayed without the risk of it getting damaged. Obviously again, this can be personalised with names and your wedding date. 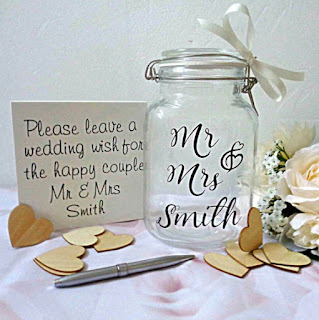 Plus you can get a specific size if you require so it is great for any size of wedding! Perfect! You can find this from Lemontree House here. This one will bring out the kid in all of us, I mean who doesn't love Jenga!? I love this idea of everyone writing their message on a block and building it! I'd probably keep this displayed on the top of a chest of drawers or such when we got home after the wedding. I feel like this would also be a nice ice breaker for everyone too and get all the guests chatting and playing and who doesn't love guests all happy and getting along! It comes with seventy two blocks so you know how many you can use, plus a couple can sign a block, one on each side, so plenty of space! You can get this fun and unique guest book from Ginger Ray at Not On the High Street here. So that are my favourite unique guests books! Obviously there are nothing wrong with your actual conventional paper guests books, as that most likely what I will have for our abroad wedding but I just thought these were some cool ideas that keep your guest book on display! I also love those Polaroid guest books so if you have a polaroid camera, that can be an amazing idea! What do you all think of these ideas? 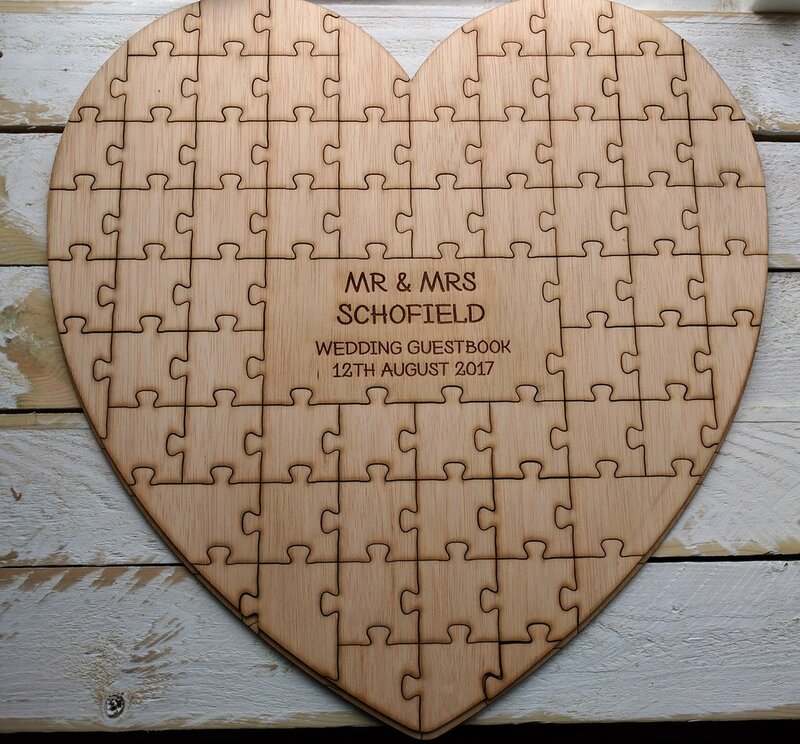 What did you do or doing for your guest book? all pictures are from online sites and have been rightfully credited and cited. I know, its mines too! Thanks so much!